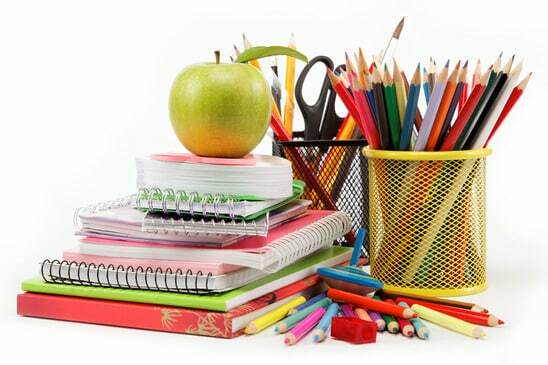 If you are in a home office or small office the chances are that you are responsible for purchasing and organizing the stationery supplies yourself. You will not have an office manager or external agent who keeps a stationery closet well stocked and regularly replenished. Here is how to organize those office supplies so that you don’t fill your drawers with useless gear, but still have the essentials on hand. Keep these close at hand, ideally in a drawer or shelf within arm’s reach. Consider moving all of these to a storage bin/basket/box that you don’t mind digging around in for a minute. Just some of the time? Perhaps the garage is a better place to store these, out of sight and out of mind. Have not been used in the last year or will never use again! Get rid of these… they are taking up valuable space! It could be a fax machine, an adding machine, or just something simple like cable ties, rubber bands, or blank CDs. Give them away to somebody who can make use of them. That calculator you have lying around: could you use the calculator (or spreadsheet) on your computer instead? The fax machine: moving to an electronic fax service could save you money and a HEAP of desk space. Even for the small items try to think about which ones can substitute for others. For example, all these items do practically the same thing: stick paper together. Can you reduce it down to just one favourite? Similarly with colored pens, highlighters, whiteboard markers: how many do you really need? Chances are only one or two, not a whole set of colors. 3. Anything stationery you still need? Check out our Stationery Checklist for commonly used items around the office. After all, organization goes both ways: you might be missing something that you need and don’t want to be caught short. Stationery used all the time such as your favorite pen can be left on the desk, but everything else should be moved off to make way for useful gear – such as your computer, notebook, and desk lamp. Clutter on the desktop makes you look untidy, and chances are, you also feel untidy having it there, distracting you from the work at hand. Office supply stores are full of plastic drawer organizers, pen caddies, stationery trays and other small-item organization ideas. They are inexpensive and now come in a wonderful array of colors and variety. As a bonus you might tend to reduce the amount of stuff you have in attempt to fit it all in the tray. You might also look around the home for little buckets or boxes that could do the same thing. Even an old plastic container (such as a yoghurt tub), cleaned out and spray painted can look great. Punch a few holes in the side and you have a unique piece that can do everything a store-bought caddy can do! Every 3 months review again before your small or home office workspace gets out of hand. Set that recurring reminder in your calendar right now and you’ll find that 5 or 10 minutes every three months is a lot easier to maintain than an hour or un-cluttering every year. 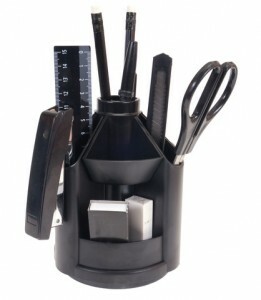 Have you come across any cool ideas for organizing office supplies in your small office or home office? Let us know! We would love to read about them.